Place tomatoes (cut side up), sweet potatoes and zucchini on a parchment lined baking sheet. Drizzle olive oil on top and season with salt and pepper. Roast in oven on 400' for 30-40 minutes or until veggies are caramelized. Combine cooked noodles with pesto sauce. Place pesto noodles in center of serving dish. Surround with roasted veggies and feta. 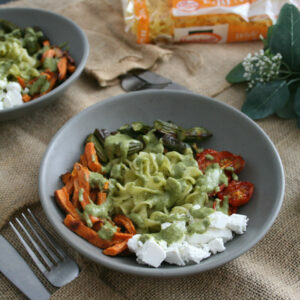 Optional, top bowl with additional pesto. Combine ingredients in a blender, pulse until smooth. Makes about 1/2 cup of pesto.